Lead generation is the process of gaining the interest of potential customers to bring in future sales. Whether you are a small or medium-sized business—and whether you have a B2B or B2C sales model—to maintain an active sales funnel, you need to be consistently attracting new leads. There are many different approaches and platforms you can use to generate leads. Among them are unpaid, organic efforts usually focusing on search engine optimization (SEO). SEO and website optimization allow your website to be easily found on search engines like Google, by people who are already searching for things related to your business. You can also use paid advertising to reach potential customers online and drive customers to your website, through pay-per-click search engine or social media campaigns. Whether you are using paid ads or not, social media websites like Facebook, Instagram, and Twitter are major platforms for digital marketers today in generating leads. And finally, tying into all of these things is content marketing, which refers to the website content, blogs, white pages, and other efforts for generating sales (for a more complete overview, read this). Generally, there isn’t ONE thing that is best for lead generation. Instead, a hybrid of several methods is the most effective way to attract more leads. That being said, writing is a tool that overlaps into many different lead generation strategies. And with all the marketing noise out there nowadays, taking extra time to improve your writing can help your business really stand out. So let’s look at why writing is so effective, and some tips on how to improve your skills. Writing is a powerful way to bring in sales and marketers know it. Content marketing results in three times the leads of traditional marketing, while costing around 62% less. According to Lyfe Marketing, B2B marketers using blogs generate 67% more leads. To understand why, let’s look at 5 reasons writing brings in leads. Well-written content gives people useful information to help them decide whether or not they want to invest in your product or service. It answers their questions without them having to reach out to anyone at your company. Effective content helps with SEO, especially through keywords and link-building and helps people find your website. Whether a blog or a photo caption, great writing can help catch people’s attention. The right caption can make a seemingly normal photo suddenly shareable and worth finding out more about the brand behind the photo. Consistent content builds your brand image when you clearly communicate what your business stands for. Through writing style and word choice, you are able to add a voice to your brand. Effective content builds your brand authority and sets you apart as an expert in your field. You become a recognizable company that people turn to for answers. It also gives past leads a reason to keep coming back. Lead generation materials are often educational and informative. At the same time, the main point of you writing those materials are to lead to an action—register for a new account, subscribe to a newsletter, purchase a product or service, etc. Before you write anything, think about what you are trying to accomplish and what you’re hoping the reader will do after finishing the content. Every brand needs to decide who they are and act accordingly. A simple guideline for doing this is to pick at least a 3-4 adjectives to describe your brand. At the same time, pick 3-4 adjectives that your brand is definitely NOT. For example, you might describe your brand traits as “playful”, “positive” and “daring”, while defining it as not being “snarky”, “peppy” or “reckless”. Using these traits as a guideline, keep the same voice throughout your website page content, social media post captions, call-to-actions, and advertising slogans. Before posting anything, ask yourself if the post stays true to the traits you’ve defined for your brand. There are no certain traits that are “the right set of traits.” What is most important is finding out what represents your brand. From there, it’s all about consistency. Imagine you’ve put a lot of time into writing a really great blog post, white paper, or infographic. That’s great! But before you are ever going to get anyone to read that content, you need to grab their attention and pique their interest with a great title. Make sure your title is an accurate representation of what the reader can expect to get out of the piece. Avoid misleading clickbait as it only annoys your audience and keeps them from trusting your brand in the future. Let’s look at some headline examples as if you were a dental company writing a post about how to floss correctly. Take the title “Flossing is Important”. Are you yawning already? Not only is the title awkward sounding and boring, but it doesn’t really give any indication as to what else you will actually find within the article. However, “5 Tricks for A Better Floss and Better Smile” is a good title. While there are probably even better titles you could come up with, it works as an example. The title tells the audience exactly what they can expect from the article, and using lists and numbers is proven to attract more readers. Lastly, “Avoid Ever Needing to Go to the Dentist Again With This Trick!”, while catchy, is probably too extreme of a claim for what the article is actually about. For more tips, check out Boostability’s guideline for high-converting headlines. Especially when posting on social media, it’s a good idea to use PPC in conjunction with your writing to reach a more targeted audience. Do your research about what keywords are most important for you to use in your ad copy. In general, it’s good writing advice to use strong verbs over weak ones, but when writing PPC copy, this advice becomes a necessity. Also, keep your messages short. People are not likely to read a lot of text anyways, and picking fewer words with more importance leave an impression and are easier to remember. Whether you’re using paid search text ads, writing a catchy image caption or creating a spectacular blog post, great writing is at the heart of most good lead generation efforts. 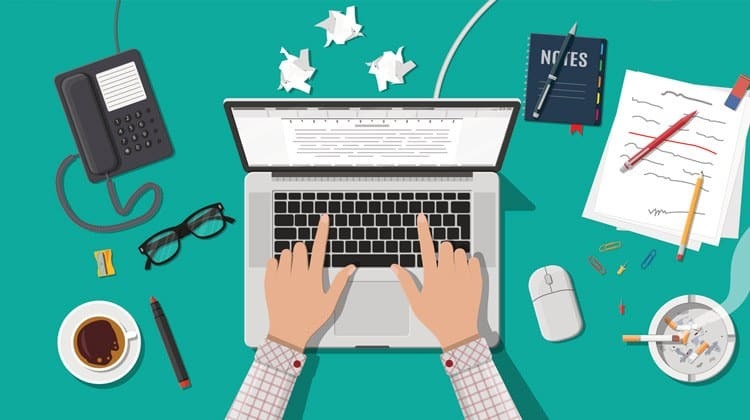 The good news is, even if you don’t feel like the world’s best writer, by applying the writing tips above, anyone can write useful content that will deliver results for their business.